I couldn’t take a step online today without seeing that Buick & Lexus have tied in J.D. 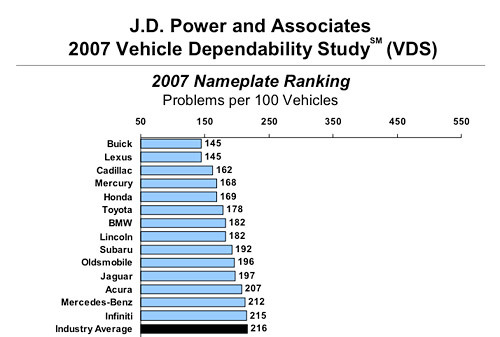 Power’s annual Vehicle Dependability Study. The study, which takes three-year old vehicles and looks at the number of problems over its last twelve months, has been thoroughly dominated by Lexus since 1993. This year marks the first time that there’s been another marque to share the spotlight, and you have to give credit where it’s due. But will Buick be able to cash in on the results? On a vehicle-by-vehicle basis, Lexus put in a commanding performance, garnering five segment awards, the most of any carmaker. The GS 300/GS430, GX 470, LS 430, LX 470 and SC 430 all took first place, with the RX 300 placing second behind the GX 470. The IS 300 and ES 330 took third place in their respective segments.